The MTA approved the fare hike in a public meeting Thursday morning. 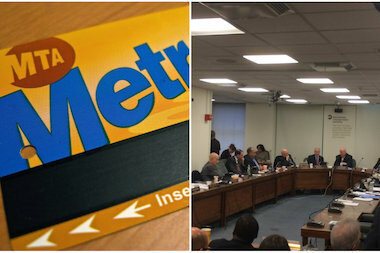 MIDTOWN — The cost of unlimited monthly MetroCards will rise to $116.50 starting in March, the MTA decided during a Thursday meeting. Base fares will rise from $2.50 to $2.75, elevating the cost of all other MetroCards on offer, the MTA said. The new fare plan, set to take place on March 22, also includes an 11 percent bonus on purchases of $5.50 and more. ► SURVEY: HOW WILL THE MTA'S FARE HIKES AFFECT YOU? Additionally, the price of 7-Day Unlimited Ride MetroCards, used for 29% of trips, will be $31 instead of $30, the agency said. The MTA board also passed a resolution increasing toll prices at its bridges and tunnels by roughly 4%. For major crossings (Bronx-Whitestone, Throgs Neck, Robert F Kennedy Bridges and the Queens Midtown and Hugh L. Carey Tunnels), cash tolls will jump from $7.50 to $8. E-Zpass drivers will have to spend $0.21 more as the toll will rise to $5.54. Crossing the Verrazano-Narrow Bridge will cost $16 (an increase of $1) for drivers who pay cash and $11.08 ( an increase of for $0.42) for those who pay with E-ZPass. MTA board members called the fares increase "responsible and responsive," emphasizing that, while they didn't like to raise fares, it was necessary to keep the MTA afloat and to ensure the overall transportation system was in good condition. The change, which was passed during a public hearing at the MTA's Midtown headquarters at 347 Madison Ave., was proposed in November. The MTA considered two alternatives, one of which would raise the cost and the other which would eliminate the bonus ride that riders usually get with pre-loaded cards. They hoped that the plans, whichever one won out, would keep the card's cost low for the immediate future. “A modest fare and toll increase is necessary to balance our budget against the increased costs of providing the bus, subway, railroad and paratransit service that is the backbone of the region’s mobility and economic growth,” MTA chair Thomas Prendergast said when the proposal was made.